"We can do better than what exists," Keith Kinnard, director of Newark Housing Authority, remarked at the opening of Vonda's Kitchen. Vonda McPherson is doing just that - bringing a mix of soul food with a fresh flavor to the Central Ward on McKinney Street. Her new restaurant will feature foods that are freshly prepared and provide healthy alternatives to the Chicken Shacks and Chinese restaurants that litter the streets nearby. She even gave a nod to the Mayor by offering some vegetarian options. Vonda isn't a newbie in the restaurant field - she started Shack's BBQ in 1998, is the head of the culinary ministry at Shiloh Baptist in Plainfield til now, and she reinvented the corporate cafeteria at the Newark Housing Authority with the Greenhouse CafÃ©. She intends to educate the community on healthy choices in her new location. Vonda is a positive spirit and Newark strong. 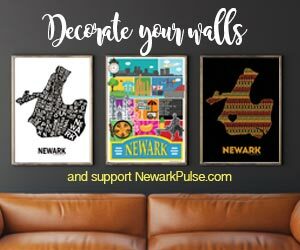 Her walls are covered by a Newark artist Frank Marshall. She will be hiring local - one of her first hires was a man named Timothy who lives down the block that approached for a job as she was leaving the work site of the restaurant. She hired him and says that she's looking forward to his growth. You can view the menu for Vonda's Kitchen here. They also offer free wi-fi and catering.